I’m always keen to try out a new kitchen gadget. So when the Judge Yogurt Maker landed on my doorstep I couldn’t wait to start creating my own yogurt. 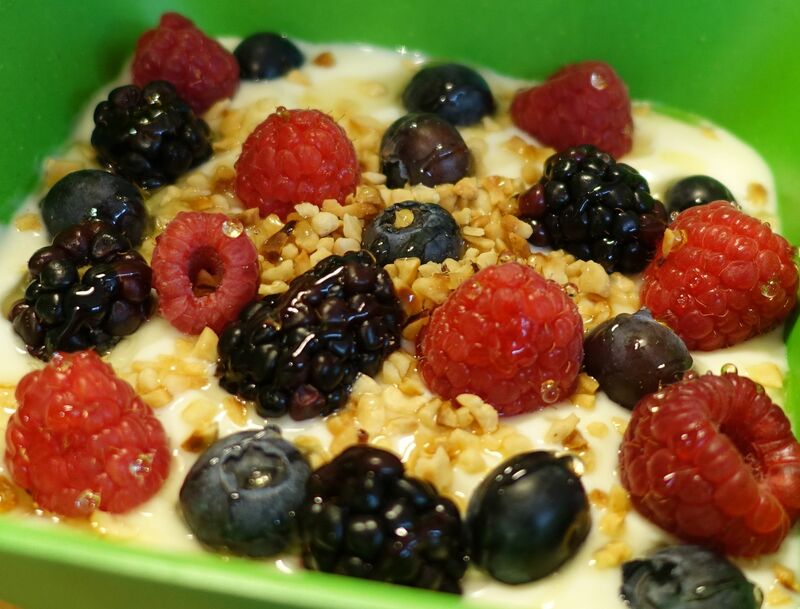 I mean who doesn’t love a big bowl of fruit, yogurt and nuts – a wonderfully refreshing way to start the day. And health giving, too. The compact machine comes with seven 15oml jars with different coloured lids, which makes it look very pretty. All you need is a litre of milk and a pot of live yogurt to get started. Simply heat the milk, then let it cool and divide the yogurt and milk between the pots. You can add chopped fruit and honey, too, to create different flavours. Then turn on your machine and let it do its magic. The process takes eight hours and you can hear the odd little click and whir emanating from the machine, though it’s generally a pretty silent operation. 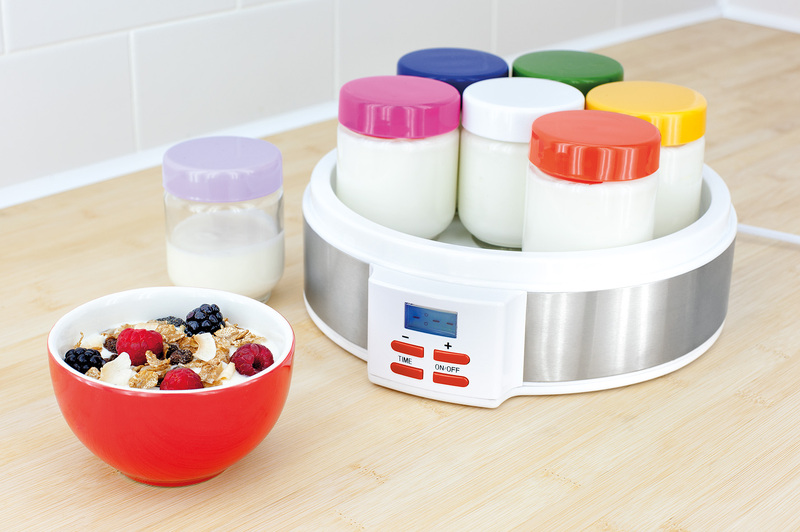 Switch it on before you go to bed and you’ll have your very own freshly-made yogurt waiting for you in the morning. I also discovered this powder that you can buy from Holland & Barrett. Simply mix it with water and turn on the machine. The Peaches & Cream flavour was delicious as was the Greek Honey. I couldn’t quite believe that some powder and water would produce yummy yogurt…but it did. So simple. 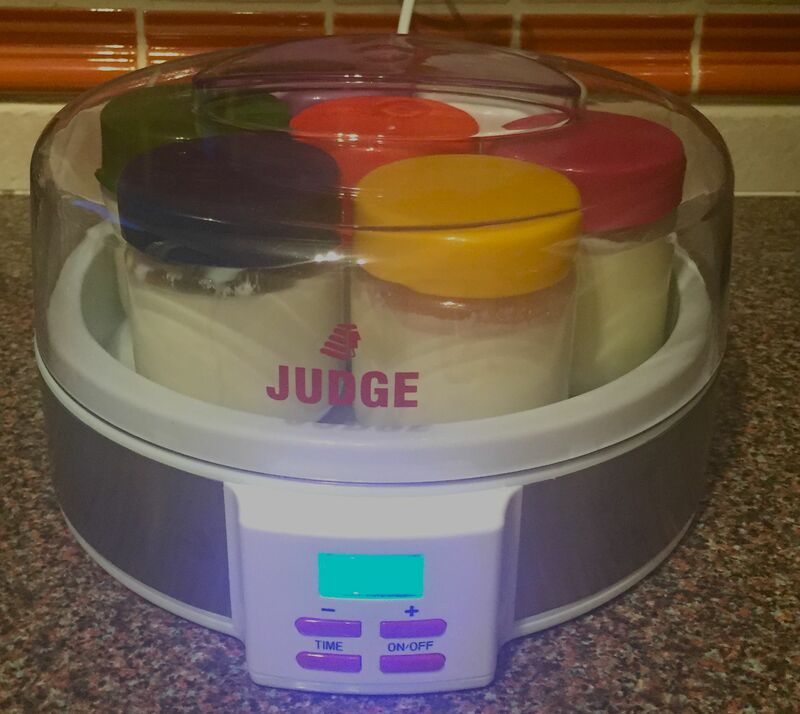 I’d recommend the Judge Yogurt Maker highly if you’re a family of dedicated yogurt eaters. 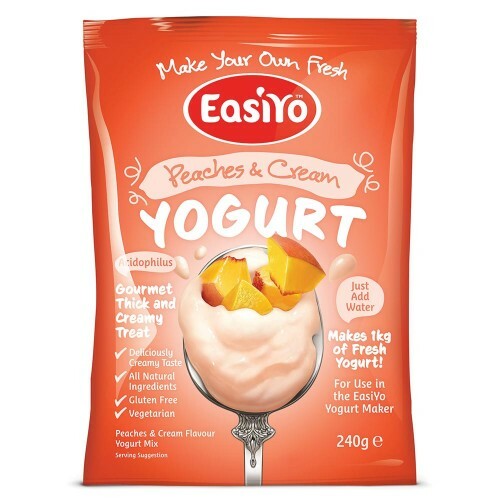 Once you’ve made your first batch you can keep using it as the live yogurt to add to milk to make more, so you’ll be able to keep the family in supply for ever, in theory. And if you’re not a dedicated yogurt eater, maybe it’s time to start. It has a raft of health benefits: the probiotics in it help to increase the good bacteria in your system which adds with digestion and your immune system. It’s also a good source of Vitamin B, Calcium, Potassium and Magnesium which means it’s good for your bones. As well as being the ideal breakfast food, yogurt is also great in marinades as it tenderises meat and it’s a useful baking ingredient to have at hand. And now you can have the satisfaction of making your very own. Why wouldn’t you?